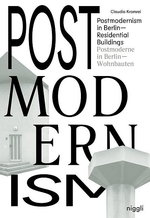 In Berlin there is a globally unparalleled density of buildings from the post-modern era, which are currently being rediscovered and that should be accordingly newly comprehended. The city and the era allowed for the most contradictory types of architecture in terms of shape and appearance by the internationally most renowned architects of the time. These veritable constructed manifests of the 1980s gave the western part of the city a new face right before the fall of the Wall and the German reunification. In this book, Claudia Kromrei introduces 30 residential buildings that were newly photographed and interpreted from today’s perspective about 30 years after their creation. Standardized layout drawings that illustrate the respective residential concepts allow the precise identification of the structural similarities independent of the diverse architectural means of expression.